Stuff have released the results of a poll they’ve conducted asking about transport funding. Auckland has sent a clear message to the Government over its transport priorities: Give us better public transport rather than better roads. 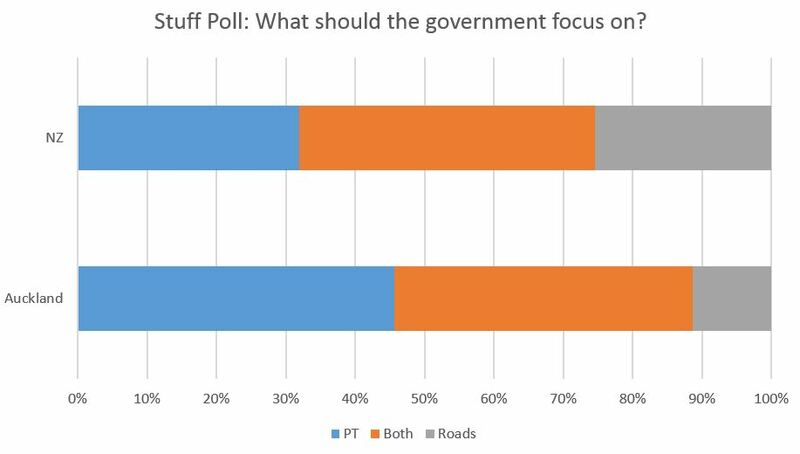 The latest Stuff.co.nz-Ipsos poll found that nationally people wanted a government focus on better public transport over roads by a margin of 30 per cent to 24 per cent. Another 40 per cent wanted a focus on both. In Auckland there was much stronger backing for public transport spending, which got the nod by a four to one margin over roads among those who had a preference. Almost 43 per cent said the focus should be on both. Additionally when asked if the government was doing enough to address congestion once again Aucklanders voted differently to the rest of the country with the majority saying no – although to be fair I’m not sure if Aucklanders will ever think enough is being done. There was a similar, but less pronounced, division between Auckland and the rest of the country when it came to traffic congestion. Across the nation 57 per cent felt the Government was doing enough to ease traffic jams in their region. Even in urban areas there was still a majority at 51 per cent backing the Government’s efforts with 42 per cent saying it was not doing enough. But in Auckland a clear majority – 54 per cent – said the Government was falling short against 43 per cent who thought it was doing enough. But Transport Minister Gerry Brownlee called the result a “confused” message, saying Aucklanders did not use public transport to an extent that made it truly economic. That he fails to grasp the difference between peoples aspirations and the reality they live in – we know that many people will only catch PT if it is rational for them to do. You could have a bus stop outside your front door but it isn’t likely to used if the buses that stop there take long convoluted and slow routes. My guess is most people probably want more investment in PT so that it becomes viable for them to use rather than the only realistic option being to drive. That he is confused about the economic and financial viability of transport systems. Both roads and PT provide economic benefits to the country by allowing for the movement of people and goods. Neither roads nor PT are currently financially viable and both require subsidies. PT subsidies are well known and often pointed out by those opposing investing in it however roads also require subsidies. About $1 billion a year is invested in them by local councils – which comes primarily from property rates – and the government themselves are spending additional money from outside of the transport budget on many of their flagship roading projects like the recently announced Accelerated Regional Roads Package. The poll will be a blow to the Government’s transport policy which has emphasised road building, and in particular its flagship Roads of National Significance, and has rebuffed calls from Auckland Mayor Len Brown for an early start to the city rail link. National also made its roading policy the centrepiece of Prime Minister John Key’s speech to National’s annual conference, with a promise to spend $212 million from the sale of state-owned assets to upgrade 14 roads across the country. “Team Key has always been very focused on roads,” Key said at the time. When I saw that Environmental Canterbury and the government decided not to give Christchurch a train service there was a huge backlash in the comments, which is not surprising, an extremely poor decision compared to the costs of many other projects in the area. And when you look more deeply into that Environment Canterbury report you can see that there is an estimated price of $1 million to $1.5million per SX carriage! Given that the report also mentions that the original rebuild cost when they first came into the country was $850000, then the estimated asking price is laughable. The estimated sell price of Auckland’s SX train on the international marketplace I estimate might be 1/10th of what Environment Canterbury have proposed. Given the overall numbers in the Environment Canterbury report, it is obvious that the asking price of the SX train-set had a big impact on how the rail option stacked up. I wouldn’t have thought there was much point in asking the question if you allow “both” as an answer. So it’s impressive how many people said “PT only, not roads”, when they had the chance to give a waffly non-answer instead. I wonder what the exact question was? I think the final sentence of the final quote explains the issue best. Without focusing on complimentary modes and capacity to rebalance inequities in the current distribution of resources that drive travel preferences there will be little change in where Aucklanders live and how they travel. Whether an individual chooses to utilise transit or private motor vehicles will depend on the perceived pay offs from each option and these are compared to the costs which can be difficult to calculate and complex to understand, especially where the infrastructure is used by more than one mode/method that is being compared. Of course Brownlee is right, that Aucklanders don’t use enough PT for it to be “truly economic”, thats not a new problem, and Auckland is not alone, almost without exception, all the top 100 cities (and bottom 100 cities) would have the same “problem” by Brownlees definition. Brownlee cites the cheapest “rail” subsidy at $15 per round trip for the shortest routes, and up to $50 a round trip for the longer routes – as if roads don’t have any such subsidies. These other cities don’t argue against such things on the simple premise that PT doesn’t ever “pay its way” – these places know that the often investment in PT is the smartest economic investment that can be made, subsidy or not for any mode, and thats why they do it. Joyce, Brownlee & co have a more fundamental problem with their language – anything spent on PT is always stated as a “subsidy”, while anything spent on any road is always an “investment”. Doesn’t matter what you call it, if the users of the road, or of PT don’t pay full costs, then they’re both subsidised. And most of the world, sees that situation as no bad thing. How much subsidy do buses get? If the naked bus company can make a profit taking people the length of the country for $20, you would think there would be a profit in the 20 minute trip from Mt Roskill to Auckland at $5, especially as the buses are almost always packed. Sort of, until you think of the number of buses that you need to run near empty late evening to get those people back the oher way at a frequency that they can use. I bet the naked bus company have times where their services are less popular; and I also bet at those times it is much cheaper to get a bus! Maybe AT should take note? Hang on Greg that’s still not right. Does Brownlee really not understand the difference between financial and economic? Is he really that dim? If so then we really are in trouble. It’s pretty clear he means that PT doesn’t cover its cost with fares, right? Well that’s true, but that is a financial measure not an economic one. Economics includes financial costs and income but also evaluates costs and benefits that are not captured directly. For example the huge advantage car users get from other people using Transit and getting out of the car lane and out of their way. If Transit in Auckland is ‘uneconomic’ as the minister says above then we definitely should stop it tomorrow, it has no point. So either he is as daft as a brush or he is intentionally eliding those two terms in order to diss the important economic work Transit does. This was routine behaviour by the previous minister so perhaps he’s just copying his master Joyce or perhaps he really doesn’t understand such an elementary difference….? And well spotted that roads are always investment but a Transit a subsidy…. Language is important, it’s how they betray their biases. It’s enough to make you vote for Winston Peters. Seriously. I can’t believe I am typing this but I am also considering that. The only reason is that the Greens have always foolishly said they would never work with National (maybe true but don’t say it, this is politics) whereas Winnie would sell his own grandmother to get into power. Of course, that might also mean his transport policy goes out the window but he is making a lot of noise about it so it will be hard for him to sell out altogether. Inside the tent, Winnie could achieve more than the Greens ever will in 20 years as opposition. And he is saying some very smart things (again, I cant believe I just typed that) on transport. You know if Kim Dot Com promised to fund the Governments half of the CRL – I’m sure at least half of Auckland would vote for Internet Mana. Now the Electoral Office may consider that to be “treating” or bribing the constituents, but I doubt most Auckland voters would care much – thats how fed up they are with the “not on my watch” approach Brownlee and Joyce obviously have over the CRL. I can’t see a Winston / National coalition. But the only chance of Labour / Greens getting in would require NZ first to make the 5% threshold so it would still be a good tactical vote. Labour have been developing some good policies across a range of areas but are being let down by a shocking lack of discipline from the top down. Today’s media soundbite from Labour in the NZ Herald – ‘Attack upsets “recharged” Cunliffe’. And so, the election agenda is being set by style and perception over substance. From today, Labour have 61 days to get middle New Zealand to listen to their policies, time to get cracking I think. I have been thinking about it. It is the only vote that can annoy National, Labour and the Greens all at once. I think I would get some pleasure out of that! Actually the greens have always said they’re happy to work with anyone to advance their policies. They’ve accomplished quite a few things with cross party support and you can also see what they accomplished with Labour. So very unlikely rather than impossible. But practically from the conversations I have had with Greens people I don’t think they could sit in the same room as a lot of National people and work in a constructive way. Same for Winnie but everyone expects that! I’ve voted Green every election since the mid 90s and I’m starting to think a National / Green coalition would be the best bet for NZ right now. It’s a shame that parties are so locked into their own dogma that they can’t see the opportunities that are there for improving NZ if they work together. Wow, Gerry Brownlee is just confused. I don’t think he is anywhere near qualified or capable of having the position of Minister of Transport. He has no tertiary qualifications in maths, engineering, town planning, logic, urban design, economics or anything that would make him qualified for the job academically. He is physically incapable of riding a bike, walking, or fitting on a bus, meaning he has no personal experience with anything other than a car or business class on a plane. He is a politician and a parrot of the “common sense” spouted from the majority of NZers from the last century that thought roads were the future at the exclusion of all else. I had the same received wisdom while growing up, so I dont knock him there. But if there are clear stats that show his position is retarded why does he stick to his views? National is failing to read the tides on this one and blindly holding onto their outdated policy despite the evidence is going to cost them. It may not cost them this election because other than transport, the other parties couldnt organise a piss up in a brewery, but it is a very sad thing to see public money spend on a fat man’s folly. Gee don’t hold back Lti. But yeah the only way I can see National ever doing anything for Auckland PT is if they give someone else that portfolio. You think they would have at least built the Northern Express extension, it could only win votes, not doing it really has an element of arrogance about it. Don’t even consider voting National if you want better public transport. It’s not just Gerry, but the whole inner circle is anti PT. Steven Joyce is anti and Bill English will make sure the money is not available (exhibit A being the decision to can the busway extension). Game over. You don’t have to be a doctor to be Minister of Health, though experience helps. You just need to listen to the evidence and take advice from qualified people. It must be. That is exactly how Gerry used to coach his Rugby teams when he was the woodwork teacher at my school. Driving up and down the driveway in his big Jag yelling out the window. To be fair, it looks like there’s not footpaths to walk the dog on…. Aucklander’s may well want better PT over roads but then it appears the majority are willing to vote for National who are unashamedly the complete opposite. Go figure! Whether it is the cult of Key or something else, there seems to be a lot of people who have a vague sense that they will do better under National, and that drives their vote. It is up to those who believe differently to talk to such people (using facts such as in this post, not vague impressions) and persuade them one by one. there is more to running a country and interacting on the world stage than just public transport issues in Auckland. I want to vote for a party that can do that, there will always be a compromise and I think National do that the best. If all a party can talk about is providing new bus lanes or free internet I don’t think I would be comfortable voting for them. I think that is why a lot of people like John Key and National not because of some cult or that they are idiots. The guy is good for New Zealand and is a credible face in amongst other world leaders. I’m not sure Cunliffe, Norman or Harre could do that. In your opinion. I know lots of people who think he’s done horrible damage, in that smiling “would I ever do something bad?” way that he has. I agree with a lot of what you are saying and I think Key has been a good face for NZ. However, as long as I can remember, the two big issues for Auckland have been transport and housing. National’s answers to those issues seem to be respectively “roads” and “the market”. I just don’t think that is good enough and is just putting faith in ideas from the past that have already produced the problems they are supposed to solve. When people point out other tools that are available to solve these problems (PT/cycling for transport, intensification/government led development for housing) the arguments back appear to be purely ideologically driven, not real arguments backed up with evidence at all. As opposed to the ideas put forward on this blog which strive to be evidence driven and politically/ideologically agnostic. That is more what I expect to see in the ideologically driven (and pointless) Republican/Democrat debates in the States, not in NZ where we should be evidence based and less ideological, more European in our approach. We already tried National’s medicine in the 1960s/70s. Only a bad doctor continues prescribing the same medicine when the symptoms keep getting worse. Meanwhile over on the car-centric Gold Coast, the new Gold Coast Light Rail opened for revenue service on Monday, and it was standing room only on several services. The system uses large 7-module trams capable of carrying 309 passengers, which through the day operate on a 7.5 minute frequency. Build it and they will come. The Queensland conservative government is already talking about funding an extension through asset sales, but can’t count on help from their Federal counterparts who will only contribute to roads. where does this fit in with this argument? That, Richard, is an argument based on nothing at all. The survey above, however is actual data and actual evidence. I see you favour blogs full of made up nonsense just like your own. That blubberguts ‘can’t’ find this information has no meaning beyond his own venal stupidity. Arent those polls that you list George just from the newspapers. Why doesn’t AT or AC have documentation that supports their position, I would have thought that they would be eager to distribute it. Polls consistently show New Zealanders, including and especially Aucklanders, favour spending more on public transport than on roads. By considerable margins. This is of course the opposite of the Government/NZTA’s agenda, which is heavily tilted to roading megaprojects. Respectfully, the oily fish is full of it. why are they full of it? the letter is a formal response from Auckland Transport. How dim are you Richard? Some minor pen pusher after an easy life at AT just answers with a form letter without even googling, or perhaps some backward AT tarmac lover or Len hater sees a chance to put the boot in, so what? We have the evidence above; so if you can pretend to not see it you can keep on kidding yourself. Official Information Act requests are only for information that’s held by the agency and isn’t publicly available. It’s not their job to Google for polls that were conducted by private entities like newspapers. But Len can cite public polls the same way any of us can read them in the paper. All that response tells you is that Auckland Transport haven’t commissioned any polling themselves, which is fair enough. It would be a waste of time to do that when that polling has already been done, repeatedly, by other people. http://www.nzherald.co.nz/nz/news/article.cfm?c_id=1&objectid=10738341 – Comparing the CRL to Puhoi-Wellsford: 63% of Aucklanders thought the CRL was a higher priority, 25% wanted the highway, 5% didn’t want either, 27% don’t know. (And possibly some want both the highway and the CRL but think the highway is a higher priority). Duh, I misread that. They asked about both separately. So that’s simply 63% in favour of the CRL. Similar to the TV3 result. the posts refer to spending on PT in general, the LGOIMA relates to the CRL. I am not ignoring any evidence, what I am asking is if people want to spend more on PT but there appears to be no support the council is aware of with regards the CRL, what and where would the PT spend be? also, its not Richard, again.